Cross-posting here and at ADKHighPeaks. Good to be here! Ascending the Ore Bed trail to Gothics, I got to enjoy the pastel pinks and purples of the early morning sun behind me. Shortly after sunrise I lingered on Gothics’ summit, basking in the glorious vistas. The breeze was stiff but warm, portending the baking-hot day ahead of me. After stopping at the amazing outcrop on Pyramid to enjoy the morning light I made my third trip to Sawteeth in six weeks. (See here and here.) 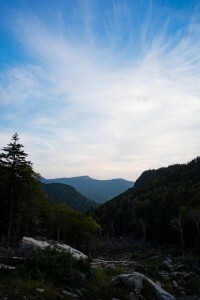 After a brief stop I descended the trail towards the Warden’s Camp on the Upper Ausable Lake. The Warden’s Camp trail to Sawteeth is amazing — no rocks or roots, just soft forest duff, and so infrequently used that last autumn’s leaves are still covering the path. This trail is so smooth, it rates a 7 on the Stimpmeter. You could roll an egg down the 2.6 miles without it breaking. While I made great time, the heat and humidity sapped my energy even on this lovely descent. At the base of the trail, I soaked my head in the frigid Shanty Brook for 15 minutes before continuing. I was hoping the path from the Warden’s Camp to Bartlett Ridge would be similarly smooth, but alas it was more typically-Adirondack rocks and roots, still a nice and isolated trail. It was also a decent climb, gaining about 1,750 vertical feet in the 2.5 miles to the Haystack junction. My pace (and picture taking) slowed and I started praying for rain to cut the tropical heat. The junction from Bartlett Ridge to Haystack is impressive: 1,200 vertical feet in 0.75 miles. The lower portion is rocky, the above-treeline portion is outright intimidating. The sun beat down the entire way, with precious little breeze or clouds. I was happy to finally summit 4,960-foot Mount Haystack and enjoy the huge summit all to myself. 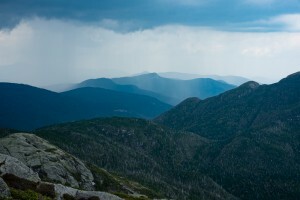 My prayers were answered as I watched the rain approach in vertical sheets from the south and west, over Skylight and Mount Marcy. The first wave came through as nearly sideways cold, driving rain, pelting me all the way to the junction with Little Haystack. I hurried over knowing that there was more to come. Indeed, almost the entirety of the rest of my hike — about 5 miles — was done in alternating waves of thunder and rain. Sopping wet, I returned to the JBL in about 11.5 hours, having hiked 17 miles and about 6,500 vertical feet. Needless to say, I made short work of my 1 lb. steak and was asleep before sunset — just a fabulous day.